A preliminary drawing of the area that is set to become a new park as part of the Mirvish Village redevelopment. Local residents had their first opportunity to make suggestions for the design and features of the park at a meeting in early July. Courtesy of Janet Rosenberg & Studio Inc.
Local residents had their first opportunity to contribute to the development of a new local green space at a public meeting on July 8. 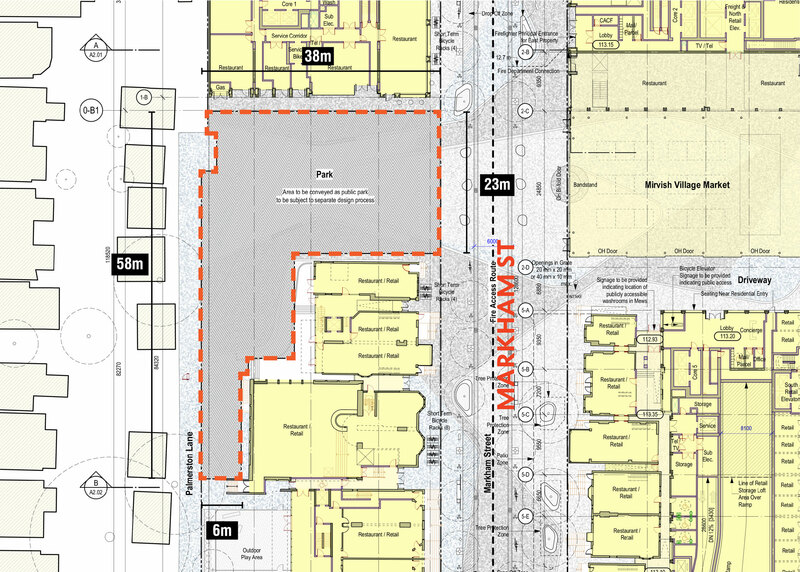 Part of Westbank Projects Corp.’s redevelopment of Honest Ed’s and Markham Street, the park meets bylaws that require new builds to include a green space. It will be paid for by the developer and, once built, maintained by the City of Toronto’s parks department. Janet Rosenberg and Studio, the project’s landscape architect, will design the park, so it will share cohesive design elements with the development while remaining distinctly public. It will serve existing Annex-area residents, roughly 2,000 new residents in the development, and the thousands of shoppers who are expected to patronize the development’s 300,000 square feet of new retail. “We want to make sure that the park offers something for all of those individuals to enjoy and that [the] elements can stand the test of time,” said Jonah Letovsky, a Westbank development manager. Approximately 30 people including developers, landscape architects, city officials, residents, and other stakeholders attended the preliminary meeting, including Sue Dexter, who represents the Harbord Village Residents’ Association on the Mirvish Village Task Force. After visiting several parks throughout the city, Dexter says the task force identified “a need for calming. The park should not be so much of an event space as it is a space for refuge. With activity and people bustling about, she envisioned the space as a sanctuary for residents and visitors to enjoy a cup of coffee or maybe people-watch. She was among many residents at the meeting who expressed an interest in extensive greenery, including plenty of trees to provide canopy and a peaceful water feature. The park will also include a mural on Markham House and other forms of public art. One of the unique attributes of the park is its shape. 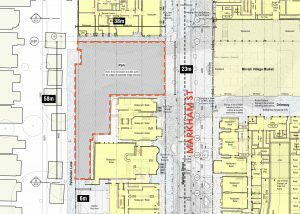 The site, abutting Markham Street and overlooking the new shops, will wrap around the newly located Markham House and then continue along the Palmerston laneway. At just over 1,200 square metres, several residents suggested that the park is too small. “The biggest concern or anxiety is that the park is not large enough to do everything for everyone really well and so tradeoffs and choices are going to be made,” said Roy Sawyer of the Palmerston Area Residents’ Association. Sawyer explained that the park is positioned within the neighbourhood to optimize sunlight throughout the day. To expand the limits of the park, more heritage buildings would have to be torn down, which both the city and the community have been adamant about preserving. “Markham Street will be pedestrian first with lots of trees, greenery, public seating, etc. If Markham Street is successful, it will feel like an extension of the park,” said Letovsky. Dexter characterized the meeting as promising. “There was such a consistency in views. I think we’re on the same page and we understand the site very well now,” she said. The park is projected to be finished within two years of the development’s completion. Westbank will continue to consult with the landscape architect to make sure the design fits its plan for the entire site, and then the final designs will be sent to the city for approval. The public will then have a chance to provide input through a series of public meetings as part of the review process. “We’re really excited because hopefully this will achieve integration into the site as well as into the city’s network of parks,” said Layton. Added Sawyer, “there’s a great opportunity to create a real jewel of a park here,” despite its small footprint.